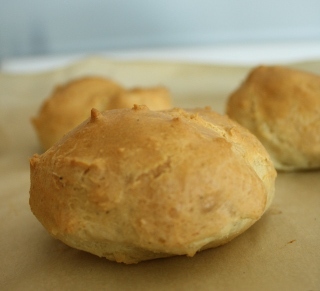 My husband had never asked me to make cream puffs before– until he became a celiac! It’s interesting to experiment with a GF recipe when I don’t have a gluten version to compare it to. But I always say my dream job would be at America’s Test Kitchen (I love their tv shows and cookbooks! ), so I just think of my life as the gluten free version. 2. Add the water, butter, sugar and salt to a saucepan and bring to a boil. 4. 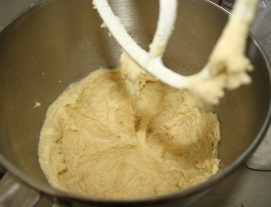 Transfer the dough to a stand mixer and beat on low speed until the dough cools. 5. Slowly add the eggs on medium speed and beat until they’re completely absorbed. 6. Use 1/4 cup to drop dough on a cookie sheet lined with parchment paper. I wet my fingers to smooth the dough, but you could also pipe it through a bag. Brush the cream puffs with a mix of 2 T milk and 1 egg yolk for a shiny crust. 7. Bake for 25-35 minutes, until lightly golden brown on top. Poke the cream puffs with tooth picks to let out the steam. This makes about 10 cream puffs, but I cut the recipe in half. This can be vanilla pudding or you can make your own. You can sprinkle powdered sugar on top or drizzle chocolate sauce. 2 Responses to "Gluten Free Cream Puff"
Did you use something instead of butter and did it still work out ok? And for the filling what did you use instead of the cream cheese? The kids would love this if I could figure out a df/cf version of it. They look very pretty! I used butter this time, because he can eat that now. however, I made these with oil when he was on his elimination diet and they turned out just the same. Derek can eat organic cream cheese, but this time I used Natural Desserts Instant Vanilla Pudding (mixed with rice milk). We bought it at harvest health back when he was on the diet, and he can’t find it now. However, you can probably do some research and find it. If you type “dairy free cream puff filling” into google there are lots of different recipes. You can look at those to see if any would work with your restrictions. And let me know if you try them! !